For round two of the concealer battle I’m pitting together two oldie’s but goodies. Now when I say oldies, I’m talking so old that not only have I had these hanging around in my collection for a tad longer than I really should, when checking them this morning it also looks like both have been, or are in the process of being, discontinued! Guess I left this review too long 😉 I was tempted to scrap this post and proceed with popping both concealers straight into the bin, but figured for anyone who currently has these, or was ever thinking about getting them, my ramblings on how good they are might be useful. So here we go! Back when Kat Von D first launched her makeup line her hero concealer was the Lock-it Tattoo. Housed in a soft tube, instead of the traditional doe foot application you instead squeeze the product directly out of the tube & then apply where needed. Like the name would suggest, formula wise you get a thicker consistency that gives great coverage. When it first launched this was my go to pick to cover any redness, blemishes or imperfections that simply wouldn’t budge. I also preferred the fact that this came without a doe foot applicator as I always question how sanitary they really are. Although at first, I was hooked on this fuller coverage concealer, over time as my skin needs changed and as newer concealers were launched into the market it became a ‘backup’ option for when I needed some heavy duty coverage. Within the Kat Von D lineup this has now been replaced with the Lock-It Creme Concealer. Again, an option that delivers up high powered coverage but sits with a heavier consistency in comparison and was a concealer I could never get on board with. Verdict – although I want to keep for those days I need a high coverage concealer I’m binning due to it’s age! 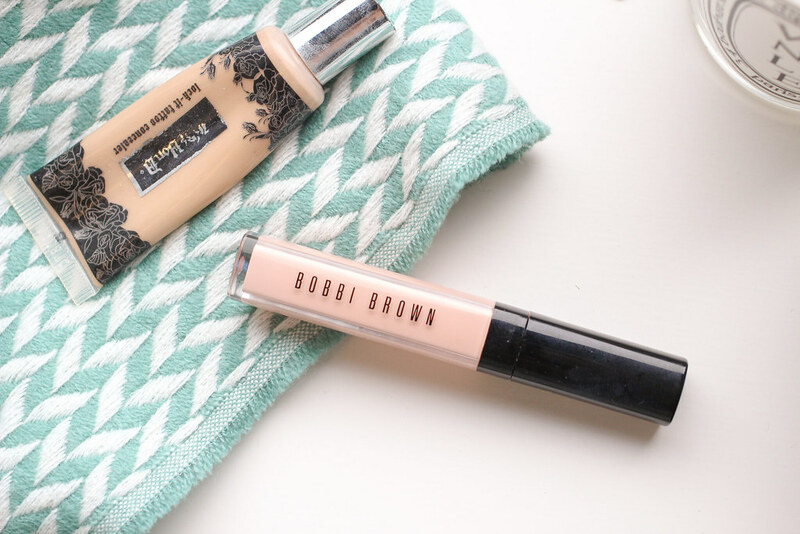 For the under eye coverage part of today’s battle it’s the Tinted Eye Brightener from powerhouse Bobbi Brown. I remember picking this up with the hopes of promised ‘refreshed & brightened under eye circles’ as I’m one of those people that is forever hunting for that perfect concealer to really counteract my dark blue circles. In comparison to the best selling Creamy Corrector, this delivers up a more malleable formula as I found the Corrector always sat on top of my skin. The thicker formula didn’t work with the delicate skin around my eyes. Although I got on with the formula, sadly this Tinted Eye Brightener never delivered on it’s promise of ‘brightened under eye circles’. The coverage is average at best and didn’t give much brightening to counteract those dark circles.